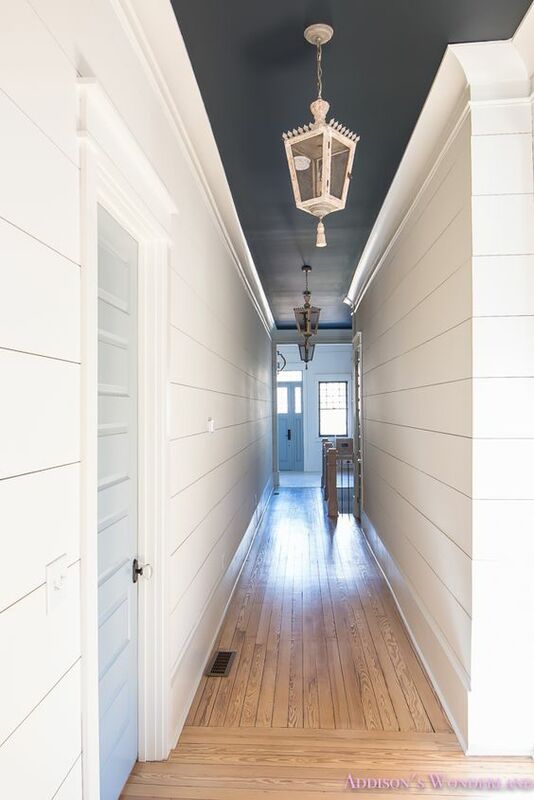 Shiplap, tongue and groove, paneling....whatever you call it, I love it all! I know this look has been trending for a while now, but I'm pretty sure I will always dig it. It's such a simple way to add character, texture, and interest to a space. There are so many different ways to update your space with this style. Take a look for yourself below! Use some white horizontal paneling to take your bathrooms up a notch. Bring in a cabin feel to your home by paneling your ceiling and leaving it in its natural beauty. Place it at the back of cabinets for a unexpected and pleasant surprise. Don't be scared to go dark and bold. Add some interest to your skinny halls. Mix it up and paint your paneling a neutral color other than white. Go with wider planks in small/busy areas. Try skinny planks in rooms that don't have much else going on. You don't always have to paint your paneling. Add some horizontal or vertical paneling to your fireplace to make it a pretty focal point. Use paneling as backsplash or on your cabinet doors. Panel your ceiling and paint it dark for a dramatic efffect and white for a light and airy feel. Use paneling to create wainscoting in your space. Or just go all out and panel your entire space!